This document provides references to Old World Trade Routes (OWTRAD) pages. McEvedy, Colin. 2002. The New Penguin Atlas of Ancient History. Second Edition. London: Penguin Books. McNeill, William H. 1987. The Eccentricity of Wheels, or Eurasian Transportation in Historical Perspective. The American Historical Review, Vol. 92, No. 5. (Dec., 1987), pp. 1111-1126. Malanima, Paolo. 2010. Energy and Population In Europe: The Medieval Growth (10th-14th Centuries). Naples: Institute of Studies on Mediterranean Societies (ISSM)/Istituto di Studi sulle Societˆ del Mediterraneo - CNR. Map Link. 1999. Central Asia. [A map, scale 1:1.75 M]. ISBN 0-929591-47-X. Santa Barbara, CA: Map Link. Map Link. 2003. Tibet. [A map, scale 1:2.0 M]. ISBN 0783498268. Santa Barbara, CA: Map Link. Markwick, Greg. 2007. Water requirements for sheep and cattle. PRIMEFACT 326. NSW DPI. Mayhew, Bradley et al. 1999. Tibet. Melbourne: Lonely Planet Publications. Merzliakova, Irina. n.d. Mountain Passes in High Asia. (v. 25 Feb 2004). Michelin. 2001. Afrique Nord et Ouest - 953: Carte Routiere et Touristique. 21st Edition, 2000/2001. [A map, scale 1:4.0 M]. Paris: Michelin Editions du Voyage. Miller, Naomi F. (ed) 2006. An Idiosyncratic and Not Exhaustive Bibliography for Animal Dung and Archaeology. University of Pennsylvania Museum. (v. 14 Jan 2006). Milner-Gulland, Robin and Nikolai Dejevsky. 1989. Atlas of Russia and The Soviet Union. Oxford: Phaidon Press Ltd.
Morales, A.L. 2000. A Handbook on the Canadian Forces Logistics Branch. Canada National Defence, Logbranch Secretariat. Chapter 3 - Logistics - A Short History. Morkot, Robert. 1996. The Penguin Historical Atlas of Ancient Greece. London: Penguing Books Ltd.
Mountfield, David. 2003. Stage and Mail Coaches. Princes Risborough, UK: Shire Publications Ltd.
Nasr, Seyyed Hossein, Ahmad Mostofi, Abbas Zaryab. (eds). 1971. Historical Atlas of Iran: on the occasion of the twenty-five hundredth anniversary of the Persian Empire. Tehran: Tehran University. The National Atlas of the United Arab Emirates. 1993. Al Ain, United Arab Emirates; Reading, U.K. : United Arab Emirates University in association with GEOprojects (U.K.) Ltd.
National Geographic Society. 1985. The Alps. [A map, scale 1:1,057,000]. April 1985. Washington DC: National Geographic Society. Nelles. n.d. Nelles Maps: Northern China. [A map, scale 1:1.5 M]. ISBN 3-88618-673-3. Munchen: Nelles Verlag GmbH. Nelles. n.d.(2). Nelles Maps: Northern India. [A map, scale 1:1.5 M]. ISBN 3-88618-686-5. Munchen: Nelles Verlag GmbH. Nelles. n.d.(3). 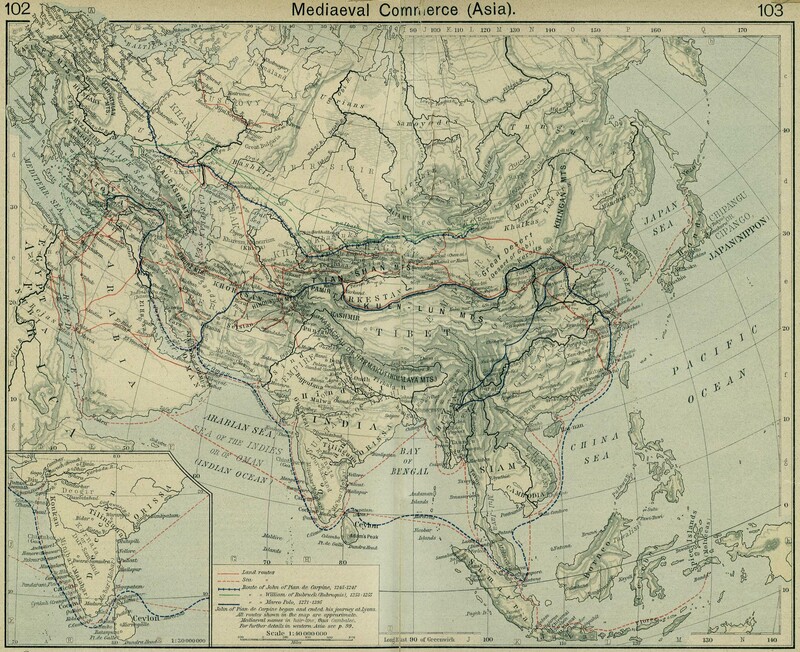 Nelles Maps: Central Asia. [A map, scale 1:1.75 M]. ISBN 3-88618-664-4. Munchen: Nelles Verlag GmbH. Nelles. 2002. Nelles Maps: Northeastern India, Bangladesg. [A map, scale 1:1.5 M]. ISBN 3-88618-692-x. Munchen: Nelles Verlag GmbH. New Oxford American Dictionary (NOAD). 2004. 2nd Edition. PC software for Mac OS X Tiger. Norbu, Dawa. 1997. Tibet: The Road Ahead. London: Random House. Norbu, Thubten Jighe and Colin Turnbull. 1976. Tibet: Its History, Religion and People. Hardmondsworth: Penguin Books. Olbricht, Peter. 1954. Das Postwesen in China unter der Mongolenherrschaft im 13, and 14. Jahrhundert. Wiesbaden: O. Harrassowitz. Oliver, Roland. 2000. The African Experience: From Olduvai Gorge to the 21st Century. London: Phoenix Press. Pal, Ranajit. n.d. Sasigupta and the Poisoning of Alexander. (v. 6 Mar 2002). Panstwowe Wydawnictwo Naukowe (PWN). 1962 (Vol. 1); 1963 (Vol. 2); 1964a (Vol. 3); 1964b (Vol. 4); 1965a (Vol. 5); 1965b (Vol. 6); 1966a (Vol. 7); 1966b (Vol. 8); 1967 (Vol. 9); 1969 (Vol. 12). Wielka Powszechna Encyclopedia PWN. Warszawa: Panstwowe Wydawnictwo Naukowe. Palmer, Carol. 2001. 'Finding Out': An Expedition in Southern Jordan. CBRL- 2OO1 Newsletter of the Council for British Research in the Levant, pp. 11 -14. Patterson, George N. 1956. Tibetan Journey. Melbourne: Readers Book Club. Pelham, Reginald A. 1966. Trade Route. In: Chambers's Encyclopaedia (New Revised Edition), vol. XIII, pp. 735-739. Oxford: Pergamon Press. Perjes, Geza. 1989. Endnotes in: The Fall of The Medieval Kingdom of Hungary: Mohacs 1526 - Buda 1541. Translated by Maria D. Fenyo with a Foreword by Janos M. Bak. Social Science Monographs, Boulder, Colorado, Atlantic Research and Publications, Highland Lakes, New Jersey. Distributed by Columbia University Press. (v. 14 Nov 2001). Pitt, Barrie. 2001. The Crucible of War. Volume II. Auchinleck's Command. London: Cassell & Co.
Pitts, Forrest R. 1965. A graph theoretic approach to historical geography. Professional Geographer, 17(5), 15-20. Polanyi, Karl. 1975. Traders and Trade. pp.133-154. in: Sabloff, Jeremy A. and C.C. Lamberg-Karlovsky (eds). 1975. Ancient Civilization and Trade. Albuquerque: A School of American Research and University of New Mexico Press. Powaski, Ronald E. 2003. Lightening War: Blitzkrieg in the West, 1940. Hoboken, New Jersey: John Wiley & Sons, Inc.
Pryor, John. 1988. Geography, technology and war: studies in the maritime history of the Mediterranean, 649-1571. Cambridge: Cambridge University Press. Racovitza, Carmen. 2005. Stefan cel Mare: Drum si Stat [Steven the Great: Road and State] (esp. an untitled draft map of Baltic-Black Sea trade route of Eastern Europe, p. 70; and map 2, 'Moldova Medievala', p. 70-71). National Geographic Romania. June 2005. pp. 58-85. Raffaele, Paul. 2002. The Other Tibet. The Weekend Australian Magazine, pp. 10-13, April 6-7 2002. Raj, Prakash A. 1985. Kathmandu and the Kingdom of Nepal. South Yarra, Australia: Lonely Planet. Ray, Indrajit and Ratna Sarkar. 2005. Reconstructing Nineteenth Century Trade Route between Bhutan and Assam: Evidences from British Political Missions. Journal of Bhutan Studies, (2005) Vol. 13. (v. 28 Sep 2007). Rawicz, Slawomir. 1957. The Long Walk. London: The Companion Book Club. Rees, David. 1970. Korea: The Limited War. Baltimore, MD. : Penguin Books Inc.
Reichenbach, Hannelore. 1997. The former woad industry. Erfurt. Kraemerbruecke Museum. (v. 18 Aug 2002). Reurinkjan. 2009. Yaks, beasts of burden. (v. Jun 2013). RIPE Network Coordination Centre. 1997. ISO 3166 Countrycodes (v. 17 Aug 1997). Robinson, Damian and Wilson, Andrew I., (eds). 2011. Maritime archaeology and ancient trade in the Mediterranean. Oxford Centre for Maritime Archaeology, Oxford. Roe, Carl. 2002. Sole Mates. The Weekend Australian, pp. 16-17, March 30-31, 2002. Roth, Jonathan P. 1999. Logistics of the Roman Army at War (264 B.C. - A.D. 235). Leiden; Boston; Kšln: Brill. de Rouvray, Cristel. 2001. Expeditions in Morocco: Caravane Route Itinerary. (v. 9 May 2001). Runciman, Steven. 1978a. A History of Crusades: vol. I The First Crusade and the Foundation of the Kingdom of Jerusalem. London: Penguin Books. Runciman, Steven. 1978b. A History of Crusades: vol. II The Kingdom of Jerusalem and the Frankish East 1100-1187. London: Penguin Books. Rutkowski, Henryk (ed). 1980a. Polska za Kazimierza Wielkiego (1370). [Poland during the reign of Casimir the Great (1370)] A map, four colours, scale 1:5 mln]. In: Tazbir 1980. Rutkowski, Henryk (ed). 1980b. Gospodarka Polski w XVI w. [Poland's Economy in the 16th c.] A map, four colours, scale 1:5 mln]. In: Tazbir 1980. Rutkowski, Henryk (ed). 1980c. Rzeczpospolita po Pierwszym Rozbiorze (1773-1793) [Republic of Poland following the First Partition (1773-1793)]. A map, four colours, scale 1:5 mln]. In: Tazbir 1980. Ryavec, Karl E. 1995. Cartographic Survey of Dzong Sites on Central Tibet. pp. 53-55 in: Himalaya Research Bulletin 15(2), 1995. [digitalcommons.macalester.edu/cgi/viewcontent.cgi?article=1498&context=himalaya] [also, the article provides a short discussion (on p. 54) of Tibetan trade routes in the vicinity of Lhasa]. Saint-Exupery, Antoine. 1995. Wind, Sand and Stars. London: Penguin Books. Saewulf. 1892. The Pilgrimage of Saewulf to Jerusalem and the Holy Land in the Years 1102 and 1103. Palestine Pilgrim's Text Society, vol. 4, pp.8-9. Cited in: Laidler, Keith. 1999. The Head of God: The Lost Treasure of the Templars. London: Orion Books, Ltd., pp. 235. Salopek, Paul. 2009. The Sahel. National Geographic, Apr 2009, Vol. 213, no. 4, pp. 34-67.
www.satelliteviews.net. 2006. Free Satellite Views and Maps of over 5.9 Million Places. Chapters: Asia and Middle East (with geodata extracted from Geographic Names Information System (GNIS) databases). Scarre, Chris (ed). 1988. Past Worlds: The "Times" Atlas of Archaeology. London: Times Books Ltd.
Schietinger, Jörg and Linda Brüggemann. 1998. The History of Telecommunications from 1840 to 1870. (v. 15 Apr 1998). Schoff, Wilfred H. (transl. and annot.). 1914. Parthian Stations by Isidore of Charax: An Account of The Overland Trade Route Between The Levant And India in The First Century B.C. Philadelphia: Commercial Museum [cited in Hopkins 1999]. Schwartzberg, Joseph E. (ed.). 1992. A Historical Atlas of South Asia. 2nd impression, with additional material. New York ; Oxford: Oxford University Press. Online edition: Digital South Asia Library. Scullard, H.H. 1970. From the Gracchi to Nero: a History of Rome from 133 B.C. to A.D. 68. London: Methuen & Co. Ltd.
Seltzer Leon E. (ed). 1962. The Columbia Lippincott Gazetteer of the World. New York: Columbia University Press. Semple, Ellen Churchill. 1901. Mountain Passes: A Study in Anthropogeography. Bulletin of the American Geographical Society, Vol. 33, No. 2 (1901), pp. 124-137. Sen, Tansen. 2009. The Travel Records of Chinese Pilgrims Faxian, Xuanzang, and Yijing. Sources for Cross-Cultural Encounters Between Ancient China and Ancient India. Education About Asia, Association for Asian Studies. New York: Columbia University..
Shakabpa, Tsepon W. D. 1967. Tibet: A Political History. New Haven and London: Yale University Press. Shephard, Sue. 2000. Pickled, Potted and Canned: The Story of Food Preserving. London: Headline Book Publishing. Shepherd, William. 1976. Shepherd's Historical Atlas. 9th Edition, Revised and Updated. New York: Barnes and Noble. Sherratt, Andrew and Francesco Menotti. 2003. ArchAtlas: a new view of the world. Institute of Archaeology, University of Oxford. (v. 15 Feb 2005). Sherratt, Andrew. 2003. The West-Eurasia World System, 3600-1400 BC. Institute of Archaeology, University of Oxford. (v. 15 Feb 2005). Sherratt, Andrew. 2005. Portages: a simple but powerful idea in economic history. Institute of Archaeology, University of Oxford. (v. 14 Jan 2006). Sims, Eleanor. 1978. Trade and Travel: Markets and Caravanserais. pp. 80-111. In: Michell, George (ed). 1978. Architecture of the Islamic World - Its History and Social Meaning. London: Thames and Hudson Ltd.
Sinclair, Joseph. 1992. Arteries of War: A History of Military Transportation. Shrewsbury: Airlife Publishing. Smolka, Stanislaw. 1959. Mieszko Stary i jego wiek [Mieszko the Elder and his Age]. Warszawa: Panstwowe Wydawnictwo Naukowe. Souter, Gillian and John Souter. 2000. Classic Walks in Western Europe. Lewisham, NSW, Australia: Off The Shelf Publishing. South Australian Museum. 2007. AustraliaÕs Muslim Cameleers: Pioneers of the Inland, 1860s-1930s [an exhibition brochure]. Adelaide, SA. : South Australian Museum. South Australian Museum. 2011. The relationships of the righteous and holy voivode Stephen the Great with the Pontic region. 21st International Congress of Byzantine Studies, Communication (I.1 Rival Empires), London 2006. Spufford, Peter. 2002. Power and Profit: The Merchant in Medieval Europe. London: Thames & Hudson. Stein, Aurel. 1918. Routes from the Panjab to Turkestan and China Recorded by William Finch (1611): Discussed by Sir Aurel Stein. The Geographical Journal, Vol. 51, No. 3. (Mar., 1918), pp. 172-175. Stierlin, Henri. 1996. Islam: Early Architecture from Baghdad to Cordoba. Koeln:Taschen. Stone, Norman (ed). 1989. "The Times" Atlas of World History. Third edition. London: Times Books Ltd.
Stratil-Sauer, G. 1935. From Baiburt via Ispir to Lazistan. The Geographical Journal, Vol. 86, No. 5. (Nov., 1935), pp. 402-410. Tazbir, Janusz. 1980. Zarys Historii Polski. [An Outline of the History of Poland]. Warszawa: Panstwowy Instytut Wydawniczy. Tajikistan Development Gateway Team. n.d. (1). History/[Silk]Way First [Also, the sections: "Way Second", "Way Third" and "Way Fourth"]. ?Dushanbe. (v. 05 Sep 2004). Tajikistan Development Gateway Team. n.d. (2). History/GREAT SILK WAY/SP1 [A map of the trade routes, a draft map, scale approx 1:9.2M]. ?Dushanbe. (v. 05 Sep 2004). Tajikistan Development Gateway Team. n.d. (3). Istaravshan-2500. ?Dushanbe. (v. 05 Sep 2004). [Tenzin Gyatso] Bstan-'dzin-rgya-mtsho Dalai Lama XIV and David Howarth. 1962. My Land and My People, The Autobiography of His Holiness the Dalai Lama. London: Weidenfeld and Nicolson. [Tenzin Gyatso] Bstan-'dzin-rgya-mtsho Dalai Lama XIV.1992. Freedom in Exile: The Autobiography of His Holiness the Dalai Lama of Tibet. London: Abacus Books. Thomas, Hugh. 1995. An Unfinished History of the World. London: Papermac MacMillan General Books. Thomas, Hugh. 2004. Rivers of Gold: The Rise of the Spanish Empire. London: Phoenix Orion Books Ltd.
Thompson, Julian. 1998. Lifeblood of War: Logistics in Armed Conflict. London: Brassey's. "Times" Atlas of the World. Revised edition of Concise Edition. 1994. London: Times Books-Harper Collins. "The Times" Index-Gazetteer of the World. 1965. London: Times Publishing Co.
Trethewey, Ken. n.d. The First Lightstructures. The Lighthouse Society of Great Britain. (v. Nov 2004). Trethewey, Ken. 2004. Lighthouses of Asia. The Lighthouse Society of Great Britain. (v. Nov 2004). Uchida, Ryohei. 1991. Kathmandu to Everest. Denby Dale, Huddersfield: Springfield Books Limited. Umberger, Steven H. 2009a. Feeding Sheep. Virginia Cooperative Extension Publication 410-853, Virginia Tech and Virginia State University. Umberger, Steven H. 2009b. Sheep Grazing Management. Virginia Cooperative Extension Publication 410-366, Virginia Tech and Virginia State University. UNESCO. 2004.The UNESCO Web Site On Caravanserais. Paris: UNESCO. (v. Nov 2004). Unusaliev M.B. and K.S. Tabaldiev. 1998. Archeological Research at the Kumtor Deposit's Area in 1997. (v. 30 Apr 2001). Urban, Mark. 2001. The Man who broke Napoleon's codes: The story of George Scovell. London: Faber and Faber Ltd.
Valli, Eric and Diane Summers. 1993. Himalayan Caravans. [incl. "An ancient cycle of trade" map, scale 1:? ?, pp. 113]. National Geographic, Dec 1993, Vol. 184, no. 6, pp. 5-35. Verma, Harish Chandra. 1978. Medieval Routes to India: Baghdad to Delhi. Calcutta: Naya Prokash. Volk, Sylvia. 2000. The Course of the Oxus River (v. 11 Nov 2000). Walz, R. 1954. Neue Untersuchungen zum Domestikationsproblem der altweltlichen Cameliden. Zeitschrift der Deutschen Morgenlaendischen Gesellschaft 104:45-87. [cited in Cohen & Yisrael 1995]. Watts, Martin. 1999. Working Oxen. Princes Risborough, UK: Shire Publications Ltd.
Westhorp, Christopher (ed). 2012. The Commando Pocket Manual 1940-1945. London: Conway - Anova Books Ltd.
Whitfield, Susan. 1999. Life Among the Silk Road. London: John Murray. Wikihow - the world's how to manual. 2013. How to Feed Cattle. Williams, Tim. 2014. The Silk Roads: an ICOMOS Thematic Study. Charenton-le-Pont: International Council of Monuments and Sites (ICOMOS) https://www.icomos.org/images/mediatheque/ICOMOS_WHThematicStudy_SilkRoads_final_lv_201406.pdf. Williamson, Margaret D., in collaboration with John Snelling. 1987. Memoirs of a Political Officer's Wife in Tibet, Sikkim and Bhutan. London: Wisdom Publications. Wilson, Andrew I. 2011. ÒDevelopments in Mediterranean shipping and maritime trade from the Hellenistic period to AD 1000Ó. In: D. Robinson and A. Wilson (eds), Maritime Archaeology and Ancient Trade in the Mediterranean. Oxford Centre for Maritime Archaeology, Oxford, 33-59. Wilson, Andrew. I., Schšrle, K. and Rice, C. 2012. ÒRoman ports and Mediterranean connectivityÓ. In S. Keay (ed. ), Rome, Portus and the Mediterranean, Archaeological Monographs of the British School at Rome. British School at Rome London: 367-91. Wilson, Andrew I. 2012a. Saharan trade in the Roman period: short-, medium- and long-distance trade networks, Azania: Archaeological Research in Africa 47.4: 409-449. Wilson, Andrew I. 2012b. OXREP Bibliography on Indo-Roman trade - A bibliography on trade between the Indian Ocean and the Roman world, compiled as part of the Oxford Roman Economy Project (OXREP). Version 1.1, December 2012. Wilson, R.T. 1984. The Camel. London and New York: Longman. Wissler, Clark. 1946. Man and His Baggage. Natural History 55:324-330. American Museum of Natural History. Wojtowicz, Piotr. 1956. Zycie Gospodarczo-Spoleczne Dawnej Polski. pp. 252-279 In: Paszkiewicz, Henryk (ed). 1956. Polska i jej Dorobek Dziejowy. London: Ksiegarnia Polska Orbis - Polonia. Wolfe, Michael (ed). 1997. One Thousand Roads to Mecca. New York: Grove Press. Wriggins, Sally Hovey. n.d. Xuanzang on the Silk Road. (v. 22 Jan 2005). Wriggins, Sally Hovey. 1996. Xuanzang: A Buddhist Pilgrim on the Silk Road. Boulder, Co.: Westview Press and Oxford: Westview Press. Xinru Liu. 1988. Ancient India and Ancient China: Trade and Religious Exchanges, A.D. 1-600, New Delhi: Oxford University Press. Xinru Liu. 2001. ÒTrade and Pilgrimage Routes from Afghanistan to Taxila, Mathura and the Ganges Plains,Ó Hindistan Turk Tarihi Arastirmalari, The Journal of Indo-Turcica, no.1, 2001, 113-140.
www.xjsoft.net. 2001. Bayingol Tourist Attraction. (v. 24 Mar 2004). Yang, Fuquan. 2004a. Fig. 1. Map illustrating the Tea and Horse Road, in: The "Ancient Tea and Horse Caravan Road," the "Silk Road" of Southwest China. The Silk Road Newsletter, Vol 2, No. 1, July 2004. The Silkroad Foundation, Saratoga, CA, US. Yang, Fuquan. 2004b. [The text, as opposed to the Yang Fuquan's map, in:] The "Ancient Tea and Horse Caravan Road," the "Silk Road" of Southwest China. The Silk Road Newsletter, Vol 2, No. 1, July 2004. The Silkroad Foundation, Saratoga, CA, US. Zajaczkowski, Ananiasz. 1961. Ethnogenesis (Chapter I) in: Karaims in Poland: History, Language, Folklore, Science. Warsaw: Panstwowe Wydawnictwo Naukowe. Zarnecki, George. 1985. The Monastic World: The Contributions of The Orders. pp. 36-66, in Evans, Joan (ed). 1985. The Flowering of the Middle Ages. London: Thames and Hudson Ltd.
Zoghby, Samir. 2000. Merchants and Potentates - Desert Caravans. American Forum for Global Education.